There have been rumours circulating about police enforcing specific requirements for D shackles, with reports on social media claiming that police were issuing infringement notices for non-load-rated D shackles being used to tow caravans, boats and trailers. So, what are the regulations around Rated D Shackles? Good question! The break load limit of the shackle is rated at least 1.5 times grater than the ATM of the trailer. Generally, the break load limit of a rated shackle will be 6 times greater than its working load limit [WLL]. Bow shackles provide for greater angular usage compared with “D” shackles. 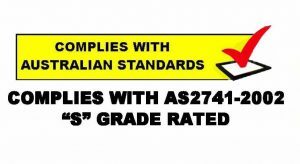 Rated bolts, chain shackles or other suitable fittings [i.e. : hammerlocks] may be used as devices for connection on safety chains providing the break load limit of the device is at least 1.5 times greater than the ATM of the trailer. In plain English, a trailer with an ATM of 750kgs should have a shackle rated at least 1125kgs. 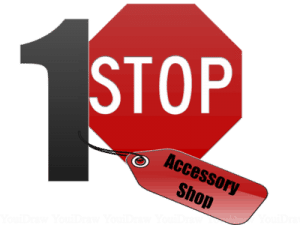 If you are buying a new towbar from us, most of our suppliers are now ‘throwing in’ “rated D shackles”. 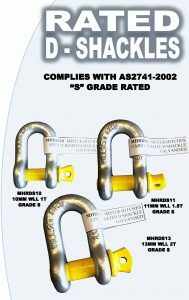 If you are purchasing a “new trailer” you should make sure that you acquire a “rated D shackle”. If you are pulled over by Department of Transport examiners and Authorised inspectors, they have been advised to “alert the driver of the towing vehicle” on the requirement to have a suitable rated device. My advice: be pro-active and get yourself some rated D shackles. For your own safety and peace of mind, you’ll be better off anyways! [this info was the best I could understand at time of publishing this article; if in doubt, always check or just use a rated D shackle].